Back in April, I posted a recipe for a traditional Shepherd’s Pie using some lovely minced lamb leftover from a Sunday Roast. 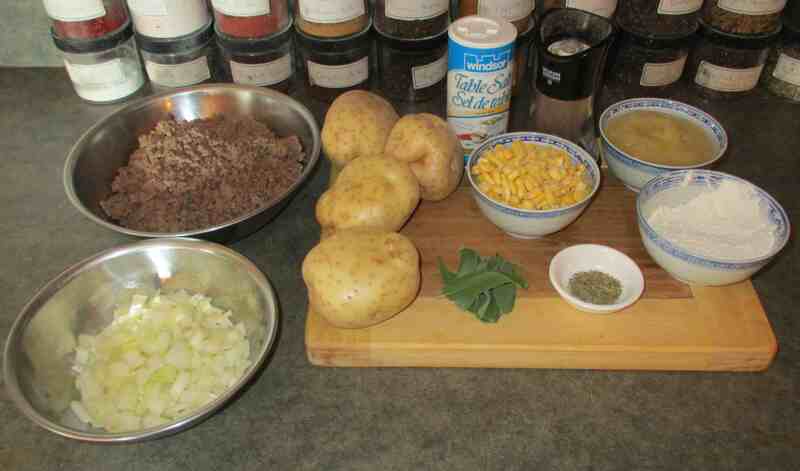 These days, what most people call Shepherd’s Pie is usually made using ground beef but, to be strictly accurate, this sort of preparation is more properly called ‘Cottage Pie’. 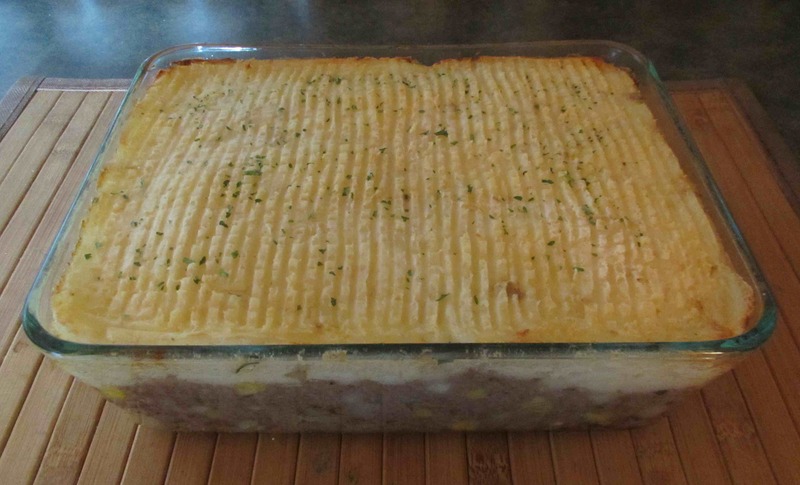 As with the more traditional shepherd’s dish, a Cottage Pie is essentially ground meat baked casserole style with a topping of mashed potatoes but, again like the lamb variety, there are countless variations. 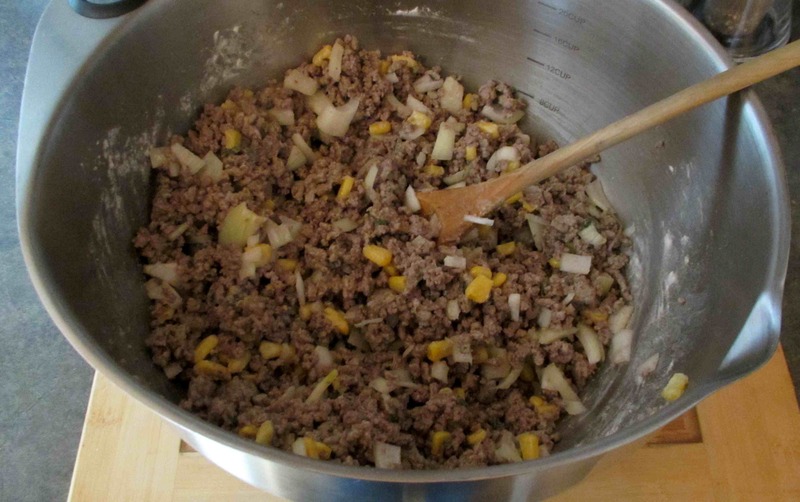 Add the beef, corn, onion, sage, thyme and flour to a large bowl along with a tablespoon of salt and a few grindings of pepper. Now, mix everything together so that all the solids are evenly coated with the flour. Now add the apple sauce and turn the mixture out into a suitable baking dish. Press down well, smoothing it all out to an even depth. Next, peel the potatoes and boil until tender in salted water. Mash them with butter (and a little cream if you have any) and spread the mix evenly over the meat mixture in the baking dish. Smooth it out and then use a fork to make furrows or an attractive crosshatch pattern over the top. If you like, you can also brush the potato topping with a little cream or full-fat milk as this will help it brown nicely. Now heat your oven to 375 degrees and cook the pie for about 45 minutes or so. If the top starts to brown a little too quickly then cover the dish with foil. 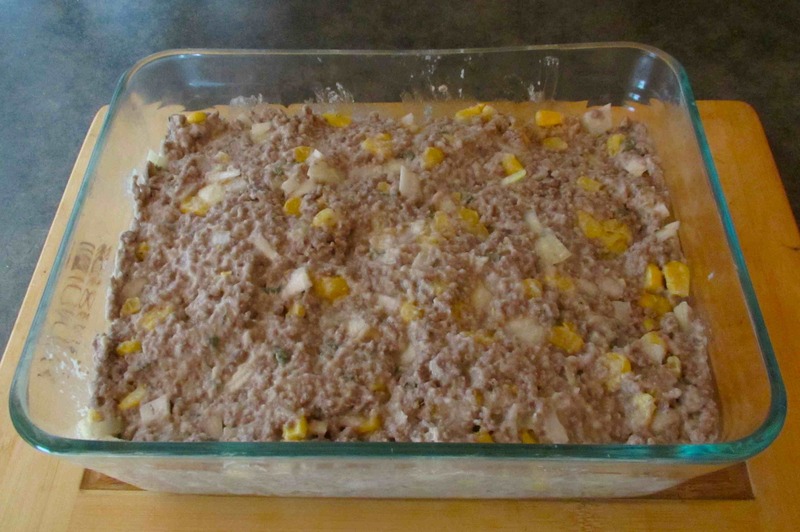 When it is done, remove from the oven and let it rest for a good ten minutes before serving. I love cottage pie. So interesting about the apple sauce! I am going to have to give that a try. And no Philistine accusations here about the condiments 🙂 Comfort food should give comfort, and when making comfort food, one shouldn’t be fussy about locavore-ish concerns! It’s likely not to everyone’s taste but now the pie just seems wrong without them to me! Gotta have me some HP with Cottage Pie!! Ketchup with mine, please. Looks delicious, saving for a cooler day, currently it is 95 degrees and humid. 16 degrees Celsius here today… lovely and warm and sunny. Thankfully, it never really gets humid here! My mother always did that… not sure if she thought of it or got it from her mother. I’ve never made it with applesauce before, sounds good. The perfect comfort food!! Nom Nom! Moms love to hear stuff like that. Tell her Tahmina all the way from Bangladesh thinks her cottage pie is the bomb and will be making it soon! I will now properly call it a cottage pie! Thanks for the lesson. 🙂 When it’s colder and I’m craving comfort food again, I will try your version. I’m curious about the applesauce. Did you use sweetened or unsweetened? It was sweetened … but that wasn’t a particular choice, it was all they had at the store. Either will work though, it just depends on your taste (and I would say dietary preferences too, but this is not an especially diet conscious meal to begin with). I still have my aircon on as the humidity and heat factor are beyond control, so sure I will give this a try and of course with a little HP sauce on the side. I would say 60 percent of the population here have never seen an air conditioner. Yesterday was lovely and sunny and nobody wore jackets outside… just 5 degrees this morning and really grimly overcast. My wife is off to Prague today and it is supposed to be sweltering and humid… she is sort of dreading it. This looks delicious!! This is definitely going to the top of my recipe list! It’s simple and full of healthy ingredients…..plus, I am not a huge meat eater and being a runner I need the iron from it, so I am always looking for yummy ways to change it up! Thank you! 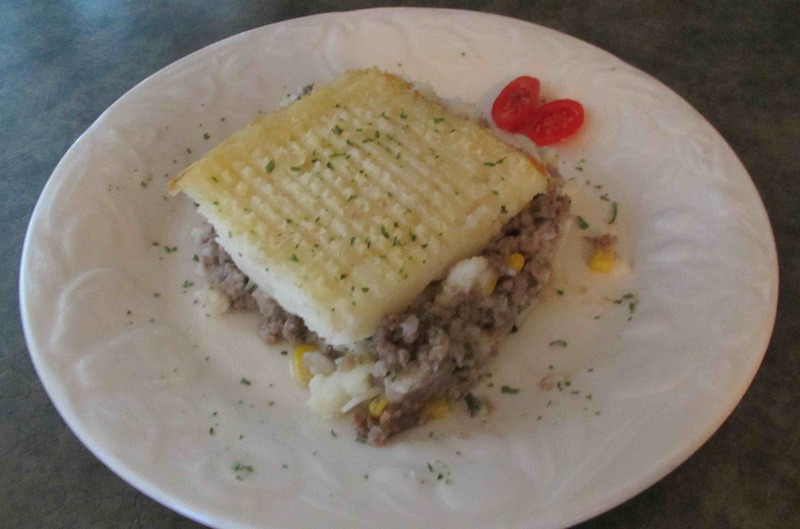 I love cottage pie and the addition of apple sauce and corn sounds heavenly!!! Ready made … to be honest, I never made apple sauce that ever turned out better than any of the commercial varieties… but I am thinking that a puree of uncooked apples with just a little lemon juice added might be interesting. I absolutely adore making a good cottage pie. Before this spring, I didn’t know there was a difference between shepherd’s pie and cottage pie, but now that I do, I’m dying to try shepherd’s pie, when it cools down a bit outside of course! 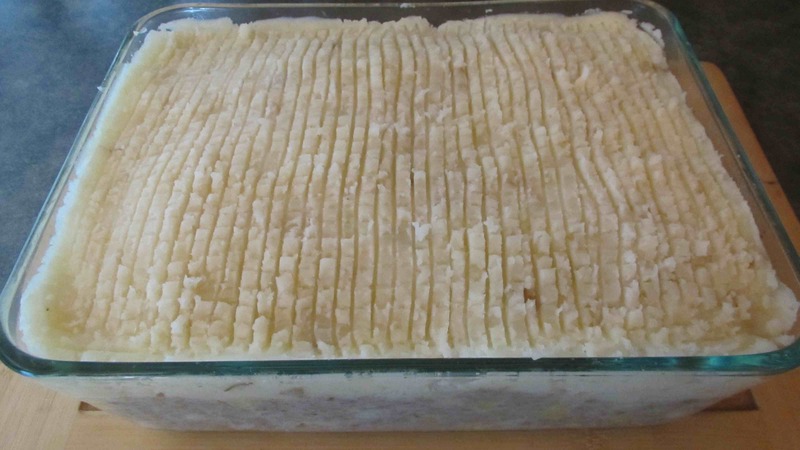 I’ve never made cottage pie with applesauce, however! That sounds like an interesting combination and I’m curious as to if you can taste the apple or not? Regardless, it looks delicious and I think I’ll make it that way next time as for the longest time, I’ve made it with gravy and it comes out soupy and my potatoes never brown no matter how long I bake it/let it sit. The applesauce sort of blends in to the background so there is a mellow, very faintly fruity sweetness… you’d be hard pressed to identify the taste as apple unless you know it’s in there. Made this way, with the flour, it doesn’t come out soupy at all… and try the cream trick on the potatoes for a nice browning but keep a good eye on it as it bakes and cover with foil if it starts to get too dark! Interesting twist with the extra vegetables and apple sacue. Now I know the difference between cottage and shepherd’s pie (blushing). Thank you! And I will definitely have to give the addition of applesauce a try. Also, love the fork furrows in the topping! Just about everybody calls it Shepherd’s Pie these days … and the applesauce is really good. I don’t know if my mother invented it herself or read it somewhere.